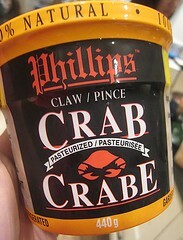 During one of my Costco runs, I saw that they were offering a discount on crab meat. Normally, I wouldn't even give this a second look, not used to buying and eating any sort of already-processed, already-shelled crustacean meat. It must be the cheapskate in me that was lured by the two-buck discount that decided to give it a try. 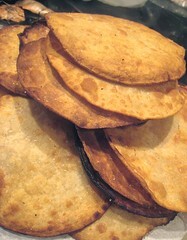 We had some corn tortillas in the freezer and I thought we could finally try a tostada. 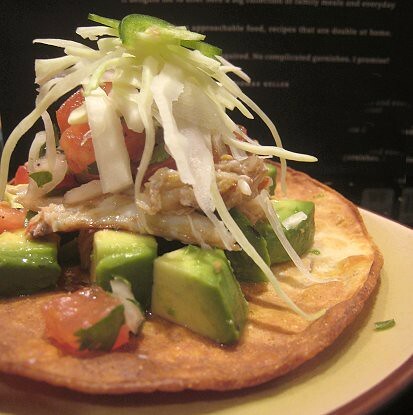 I've seen tostadas on menus before but have never ordered them, always being tempted by tacos instead. Now for the verdict, the good and the not-so-good. Unfortunately, nothing beats meat from a live-from-the-tank-before-you-eat-it-crab and there is a big, big qualitative difference between that and this processed and pasteurized crab meat. 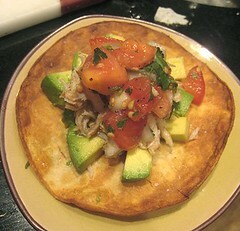 We made our crab meat better by squeezing lime juice all over it. That seemed to restore the meat to some semblance of live-before-you-eat-it-crab freshness. 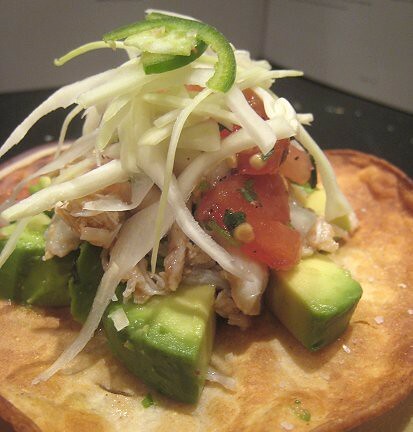 Our "winging-it" crab tostada consisted of fried tortilla, avocados for the "creamy" component (because we didn't have beans, refried or otherwise), lime-spiked crab meat, pico de gallo (tomato salsa), shredded cabbage and jalapeños. 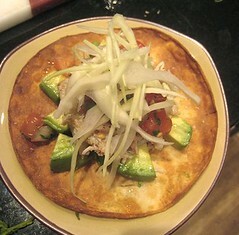 The crab tostada, on the whole, was very good. What's not to love? 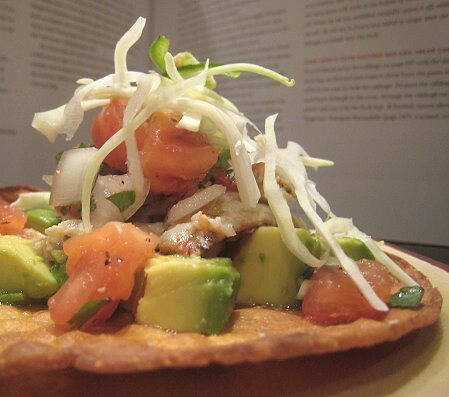 Crispy corn tortilla, sweet-briny-salty crab meat, creamy avocado slices, and a piquant pico de gallo with juicy tomato chunks, crunchy cabbage slivers. 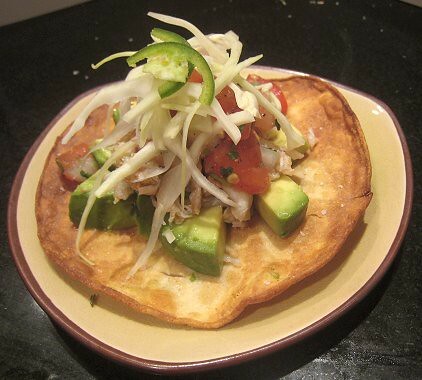 . . the whole tostada is definitely more than the sum of its parts. Those look tasty. Maybe you need to find a grocery store that sells fresh picked crab meat? 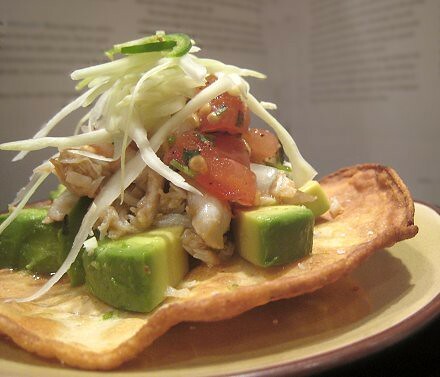 Crab tostadas sound so decadent and good! 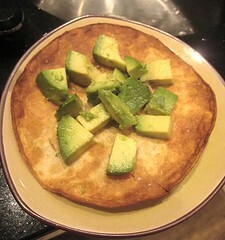 Hi gals - This looks great and better with avocado vs beans...much fresher taste. I've picked up that brand before and it's quite good. 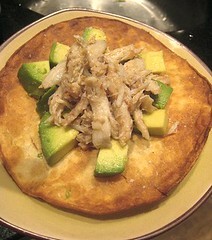 I think I must buy avocado and make tostada tonight. Yours is very pretty! this brand of crab meat is what we used for making crab/asparagus soup or some of the other crab soups such as bun rieu..but your creation looks great..the tortas here in LA tends to get really soggy quick and yours look still crispy! Actually, we're the same way. But I guess the DISCOUNT called out to us. LOL. Yeah, this crab meat definitely is better cooked than eaten as is. We should yry making crabmeat & asparagus soup one of these days!